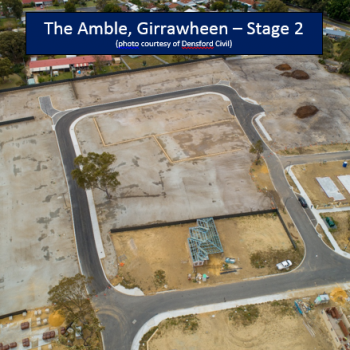 Porter Consulting Engineers recently completed the design and construction administration of Stage 2 of The Amble in Girrawheen. This stage was successfully completed ahead of schedule and under budget. Now onto Stage 3 which is programmed to commence in early 2019. This urban infill project is a collaboration between the Department of Communities, Yolk Property Group and Ventura Home Group which will eventually deliver a minimum of 129 dwellings for more than 200 residents, comprising a mix of one and two-bed apartments, 15 townhouses and 90 single detached houses. The below photo shows the site following completion of the civil works by the contractor.